Killam Laureates at Dalhousie make groundbreaking research advances that have shaped everything from immigration policy, to cancer treatment; world economics, to law and literature. Focused on enabling our brightest minds to make significant contributions to their chosen field, Killam scholarships and fellowships provide the resources researchers need to fully realize their goals. Created by a 1967 bequest from Izaak Walton Killam and Dorothy J. Killam, the Killam Trust endowment at Dalhousie has grown to more than $140-million and benefited 1,783 graduate students and postdoctoral fellows over the past half century. 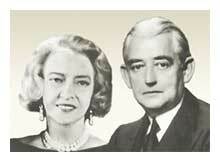 When Izaak Killam died in 1955, Dorothy Killam continued to build the Killam fortune. When she died in 1965, she left almost $100 million – $450 million in today’s market – to higher education in Canada. Her Will outlined the creation of the Killam Trusts, established to fund graduate and postgraduate scholarships and fellowships, as well as a range of other scholarly activities at specific Canadian universities. Dalhousie was the largest single recipient alongside the University of Calgary, University of Alberta, University of British Columbia, and Montreal Neurological Institute at McGill University. The Canada Council for the Arts also received Killam funds, which support the Canada Council Killam Fellowships and Canada Council Killam Prizes, open to researchers from all Canadian universities. Izaak Walton Killam Memorial Scholarships are the most prestigious graduate awards administered by Dalhousie University. These awards are offered in support of studies in programs requiring a thesis and leading toward either a Master’s or Doctoral degree. The scholarships are tenable for two years for Master’s candidates and up to four years for Doctoral candidates. For students not already studying at Dalhousie, a travel allowance to move to Halifax is also added to the scholarship amount. The awards are valued at up to $26,000 for Master’s candidates, including the International Differential Fee (IDF) award, if eligible, and up to $40,000 for Doctoral candidates, including the President’s award and the IDF award, if eligible. Izaak Walton Killam Postdoctoral Fellowships are awarded to outstanding individuals who have completed a doctoral program within the last two years. Approximately four to eight new fellowships are awarded annually. The award is tenable for two years, subject to satisfactory progress. The awards are tenable only at Dalhousie University; however, students who have received their doctorate from Dalhousie University are not eligible. The fellowships are valued at up to $55,000 annually including full benefits and a travel allowance for transportation to and from Halifax, a one-time research allowance of $3,000 and a conference travel grant of $1,000. The Killam Memorial Chairs are academics of the highest distinction and are appointed for five-year terms by a committee chaired by the Provost and the Vice President Research. Each Killam Memorial Chair at Dalhousie is expected to be a senior research leader and to pursue a research program that advances University and Faculty research priorities; as well as presenting a highly positive profile for research both internally and externally. Renewal will be considered upon the recommendation of the Dean of the Faculty involved, similar to the request for a new Chair. The awards provide salary relief to a maximum of $100,000 with an additional Faculty commitment of a minimum of $25,000 towards research funding. The Faculty of Science Killam Prize was established in 1994/95 by the Faculty of Science of Dalhousie University in recognition of the financial support provided to the Faculty by the Killam Endowment. One prize is awarded annually to enhance the careers of the most promising scientists in the Faculty of Science who have obtained their doctorate within the preceding eleven years. The winners must demonstrate exceptional research ability through their contributions to scientific knowledge. The prize is accompanied by an award of $2,000. The Faculty of Science Killam Professorships were established in 1994/95 by the Faculty of Science of Dalhousie University in recognition of the financial support provided to the Faculty by the Killam Endowment. Up to ten professorships are awarded to faculty members in the Faculty of Science, for a term of five years. Their purpose is to recognize the careers of the most outstanding scientists. The winners must have made outstanding contributions to their fields. Each professorship is accompanied by an award of $2,000. These Prizes are awarded annually to the most outstanding Killam Memorial Scholarship recipients, the top ranked Master's and top ranked Doctoral award winner. Recipients receive a cash prize of $2,500 and a certificate of acknowledgement. Recipients are selected based on academic achievement, a research proposal, letters of recommendation and leadership qualities. The George Cooper Prizes were inaugurated in 2016 as a tribute to Halifax lawyer and former Managing Trustee George Cooper, who was a Killam Trustee for 34 years, 24 of those as Managing Trustee.